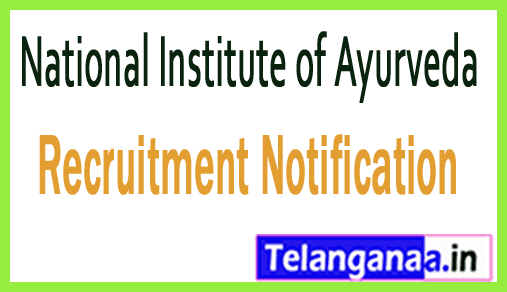 A vacancy advertisement has been declared by the National Institute of Ayurveda in the name of NIA recruitment to inform the desired and spectacular candidates for 48 posts of pharmacists, nurses and clerks. Eligible candidates can apply for NIA vacancy by submitting applications through offline mode on or before the expiry date of 31 October 2018. The Contestant is advised to submit relevant documents with the NIA application on or before the expiry date of 31st October 2018. Interested and brilliant, interested candidates can get the rest of the information about NIA recruitment 2018, which can pass through this page as described by the team of www.telanganaa.in. Eligibility Requirement: Job searchers should have 10th / 12th / Diploma or equivalent examinations from any recognized board / institution. Candidates applying for the above post and belonging to the general / OBC category, they have to pay the application fee. 2000 / - (1-3 posts), 1800 / - (post 4). Interested candidates belonging to SC / ST category will get Rs. 1600 / - (1-3 post) as application fee, 1400 / - (post 4). Applicants applying for this recruitment will have 30 years of age (post 1, 2), 27 years (post 3), 25 years (post 4). Salary details: Appointments to candidates for pharmacists, nurse, clerk posts are Rs. 2900 - 92300 / - (post 1, 2), Rs. 19900 - 63200 / - (post 3), Rs. 18000 - 56 9 00 / - (Post 4) which is offered by National Institute of Ayurveda. On the basis of their performance in the written examination, merit, the participants will be recruited against this recruitment which is being organized by the organization recruitment committee. First of all, go to NIA web portal which is http://www.nia.nic.in. Deadline for submission of application in filling: 31-10-2018.